It's time to tackle ignorance with something that can't be beat - laughter. Enjoy this video. A large screen will let you read the witty signs more easily. Don't be fooled by bigots and hate mongers. 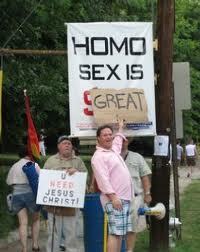 Remember what Jesus had to say about gays, " ...... ."
help of humour, indeed it is! I'm over here via Cheri, whom I adore. This was really funny, and right on target! Thanks ANNA-LYS...but what does ROFLMAO mean? the guy dressed in the plaid shorts and pink shirt proves not all gay people are fashionable. if people weren't stereotyped but accepted as unique individuals, much of the hate, unhappiness and anger in the world would simply disappear. lol!!! it's refreshing that the folks with the most reason to be angry are choosing gentle humor. i once shut down a bible study with the question, "Ted #1 is heterosexual and nobody knows it except her, but he beats his wife. Ted #2 is homosexual. in every other way they're the same. who's doing the most harm?" i the bible study leader's name was Ted. no, he did not beat his wife. how come everyone around me is wearing 'i'm with stupid' teeshirts? look in the mirror: diputs with m'i. Great humour and political insight on your Blog! Down under our 2010 historic election smashed the two-party system to overturn that previous dominant force since WW2 under our proportional representation voting system. You may be interested to know what Greens Senator Sarah Hanson-Young said ‘If seats in the national Parliament were allocated on the basis of the share of the national primary vote, the Greens would have 17 new MPs’. Greens registered double figure percentages everywhere to enable many sitting Labour candidates to tentatively cling on to power only due to the greens preferences - Labour Treasurer Wayne Swan being one case in point. In Australia you’re able to vote for whatever you choose but most people simply follow their parties voting card which pre nominates the preferences. Consequently the preferences determine the outcomes in many seats and the Greens gave their preferences mostly to Labour. Given a very likely ‘hung’ parliament the independents and Greens will have the balance of power. The Australian Parliament joins others whose voters are signalling a change away from major party dominance. Dear Doctor Laura...Can I buy a Canadian?